A text tool feature is a major game-changing addition for many artists who rely on Procreate as their main iPad illustration app, especially comic artists. Before, users had to import text created in other apps (such as Pixelmator) as image files, or export their Procreate files and add text later. Today’s update lets artists keep their entire workflow within Procreate, without having to switch between several different apps. 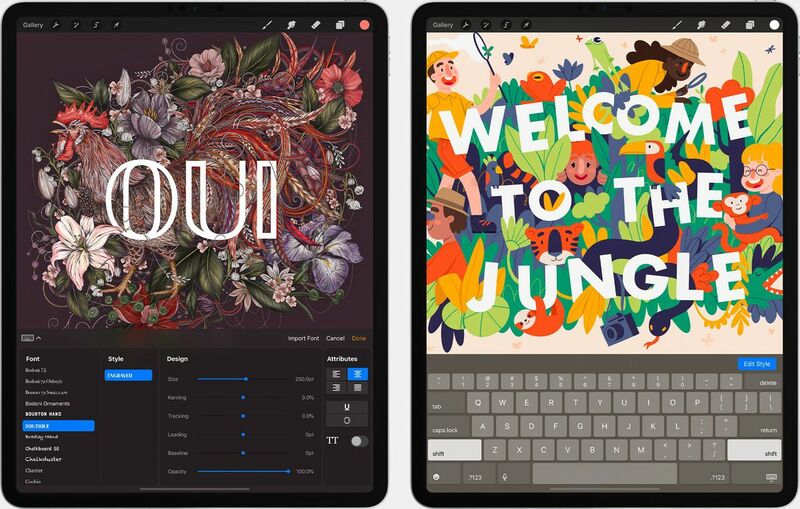 The feature is also notable because many drawing apps don’t include a Text tool, as a text engine with several different fonts could slow down the app. Procreate’s text tool allows for text to be manipulated in vector format with warp and transform features and rasterized when changes are committed. Additional features include more Blending Modes and improved pressure smoothing. Layers can also be exported as folders of PNG files and multiple pages of a PDF. The update is free for existing users, and Procreate is available on the App Store for $9.99.